COP23 in Bonn this month reaffirmed that sub-national regions lead the energy transition. Not only can they lead, they are actually leading by example. This is true in Europe, the United States and in the small island developing states (SIDS) that in effect act as a unified region calling for the rest of the world to react and not let them go under. Regions are reacting more than nations are, usually due to closer proximity to the people but also due to political circumstances. In the more combative political style of the United States, some states such as Virginia, California, Washington and Oregon have come together to form the U.S. Climate Alliance. Along with the “America’s Pledge” and the #WeAreStillIn campaign, the governors of these states were present at COP23 to send a joint message: “TRUMP CANNOT STOP US” was resounding loud and clear as they move to implement clean energy funds, offshore wind farms and very important: carbon pricing per ton of CO2 emissions. Dieter Salomon, Mayor of Frieburg, enthused about the U.S. Climate Alliance and the role that mayors and governors can play in advancing real change to combat climate altercations. 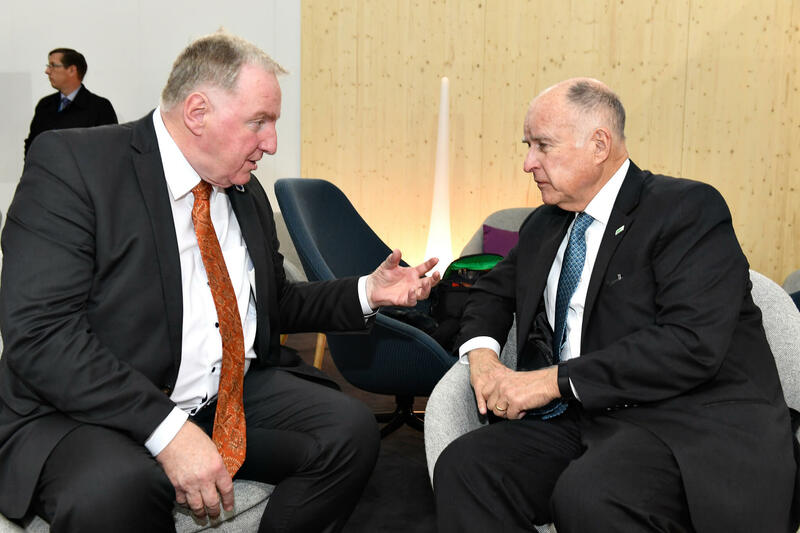 President of the Committee of Regions (CoR), Karl-Heinz Lambertz from the small German region of Belgium said that Bonn would be a stepping stone for implementing the Paris Agreement at COP21. The European Committee of Regions and Local Governments for Sustainability (ICLEI) came together to issue a joint Declaration, adopted at a Climate Summit of Local and Regional Leaders on the Day 7 of the two-week COP23 saga. The Declaration combines unilateral commitments with a set of calls to action by the nations of the United Nations and the United Nations Framework Convention on Climate Change (UNFCCC). The pledges include promises by cities and regions to be more ambitious, pro-active, comprehensive, consistent, collaborative and transparent in their climate actions. Local and regional leaders also urged the United Nations and world’s governments to collaborate with all levels of government and support the introduction of carbon emissions-reduction targets for regions and cities. In Paris in 2015, the world’s governments agreed to keep the increase in global average temperature to well below 2°C above pre-industrial levels though recent figures suggest the world is on course for a 2.7°C rise. While the European Union and its regions are playing a leading role in the advancing the energy transition, there is an unresolved impediment that is meant to punish the polluters by having them pay a price for their carbon emissions but that is really not – the EU Emissions Trading Scheme (aka EU-ETS). Considered the cornerstone of EU climate action policy, the EU-ETS is not punishing polluters at all, on the contrary: an insular market has been created and carbon credits are traded on this market by the polluters who are actually making billions off of the scheme. The EU-ETS was prolonged for another decade at COP23 in Bonn. Italian Member of the Committee of Regions, Marco Dus, said that the carbon price in the ETS needs go up for it to be more effective and claimed that finding an equilibrium amongst the 28 EU Member States is always difficult. Dus also mentioned that China is looking to apply ETS in some of its regions as trial case studies. China is already moving to set a $5 carbon price in 5 of its cities which is very low indeed but nonetheless a carbon floor price which Europe has yet to implement. Watch out for carbon pricing, it’s the core and crux of all these climate talks: how much are we willing to paying to counter our pollution?